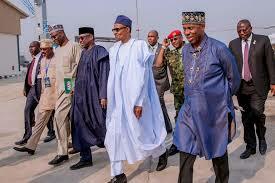 Buhari with Rotimi Amaechi, left and Secretary to the Government of the Federation, Boss Mustapha, right at the Baro Port on Saturday President Muhammadu Buhari has commissioned the Baro Inland Water Port in Niger State. The contract, costing N6billion, was originally awarded in 2011/12, then abandoned, until Buhari’s government forged ahead to deliver it. 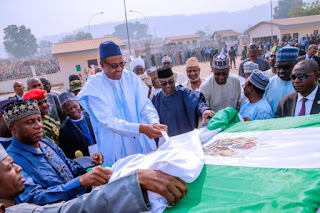 Buhari will also later hold a campaign rally in Minna, the Niger State capital. 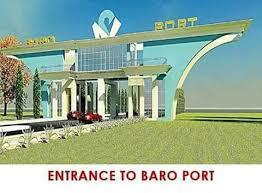 The Baro port was built by CGCC Global Project Nigeria Ltd.
Mr Tayo Fadile, General Manager in charge of Corporate Affairs, National Inland Waterways Authority (NIWA), said the new port is fitted with a Mobile Harbour Crane, Transit shed and an Administrative block. 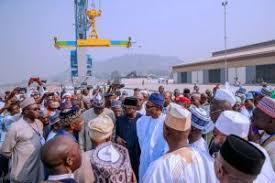 Buhari going round the port “It is also equipped with facilities such as water hydrant system, water treatment plant, reach stacker, 100KVA power generating set and three forklifts of various tonnages, among others. 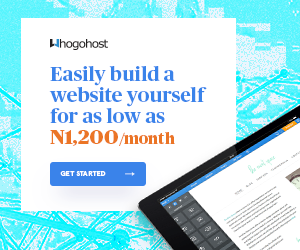 “Baro Port is one of the river ports being built by the Federal Government to support the dredging of the Lower River Niger project. “The Baro river port is expected to create at least 2,000 direct jobs and hundreds of thousands indirect jobs. “It will help keep off the road several heavy duty trailers and trucks, thereby extending the life span of our roads,’’ Fadile said in a statement. 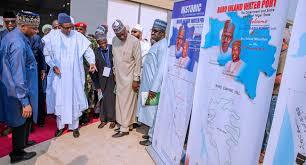 He said that NIWA had started upgrading the road network linking the port.